Four storage tanks linked together to form a large storage facility. The storage tank is a building that can store up to 25,000 units of a fluid. It is a passive storage — it has no input and no output, depending on pressure to fill it, essentially acting as a large pipe. Storage tanks will only be filled to the same percentage of capacity as pipes that lead to it. A pipe that carries about 50 water will fill the tank to about 50% of its capacity. Pumps can be used to fill the entire tank from a low pressure source (such as distant pumpjacks). The storage tank is often used to store raw materials and excess products from oil processing, allowing a refinery to run without interruptions. It can also be connected to the circuit network, sending the fluid contents as a signal to the network. The storage tank can be emptied by mining and rebuilding it (the fluid is destroyed) or by draining it with a pump. 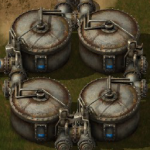 Storage tanks can also be used as a replacement for accumulators. If steam consumption by steam engines or turbines changes a lot over a daily cycle (for example due to solar panels or laser turrets), storage tanks can be filled with steam during low power usage and then emptied during heavy load. A storage tank filled with heat exchanger 500°C steam stores around 2.4GJ; a storage tank filled with boiler 165°C steam stores 750MJ. 1 Storage tank can store 25,000 units of 500ºC steam. 1 Steam turbine can output 5,820kW = 5,820kJ/s using 60 units of 500ºC steam/s. A Storage tank can store up to 25,000 ∕ 60 × 5,820 = 2,425,000kJ using 500ºC steam. 1 Storage tank can store 25,000 units of 165ºC steam. 1 Steam engine can output 900kW = 900kJ/s using 30 units of 165ºC steam/s. 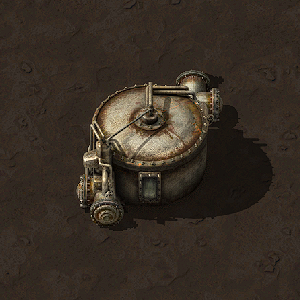 A Storage tank can store up to 25,000 ∕ 30 × 900 = 750,000kJ using 165ºC steam. Multiplied all fluid amounts by 10. Fluid icon now scales with size of tank. Liquid inside can be seen through a small window. Now has double capacity and takes longer to mine. This page was last edited on 11 December 2018, at 05:40.